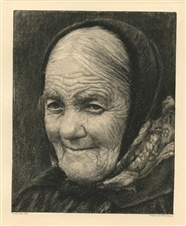 Georg Jahn original etching "Alte Frau"
Medium: original etching. Executed in 1900 and published in Leipzig, Germany for Zeitschrift für Bildende Kunst. This impression is printed on cream wove paper; the plate measures 8 3/4 x 6 1/2 inches (213 x 165 mm). Not signed.